New EIP visits will be announced at least one month in advance via the UC San Diego Postdoc Association Listserv or on the EIP LinkedIn or PDA Facebook groups that you are encouraged to join. Follow the application guidelines below once you hear of a visit that interests you. We enforce an application deadline for each individual visit to allow for the selection process! Although we do favor new applicants during the selection process, we do not limit the number of visits of EIP alumni. We will be selecting the applications based on who the company would like us to bring and how well your skills match their research & development or the purpose of the visit. Due to the large number of applications we receive, we have recently introduced a short essay as a part of the application process in which you can express your specific interest in the particular company we are visiting. Interested in a Career In Industry? 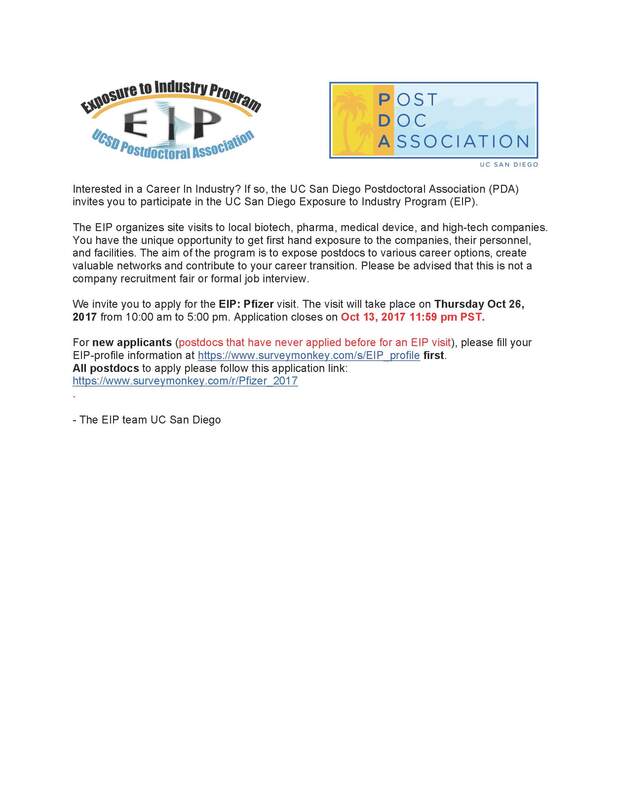 If so, the UC San Diego Postdoctoral Association (PDA) invites you to participate in the UC San Diego Exposure to Industry Program (EIP). The EIP organizes site visits to local biotech, pharma, medical device, and high-tech companies. You have the unique opportunity to get first hand exposure to the companies, their personnel, and facilities. The aim of the program is to expose postdocs to various career options, create valuable networks and contribute to your career transition. Please be advised that this is not a company recruitment fair or formal job interview. Pfizer is considered one of the world's premier pharmaceutical companies. The company develops and produces medicines and vaccines for a wide range of medical disciplines, including immunology, oncology, cardiology, diabetology/endocrinology, and neurology. Application closes on Oct 13, 2017 11:59 pm PST. Apply soon as there are only 20 spots. For new applicants (postdocs that have never applied before for an EIP visit), please fill your EIP-profile information here. All postdocs to apply please follow this application link.